Few months ago, I (Cherry) met one of my friends in high school days. Her eyeliner was quite sharp, and never run. I asked her which she is using, and it was Coffret D’or Black Keep Liner WP. The eyeliner works like a fountain pen. A barrel holds the ink cartridge and the brush tip, and there is a cap. Each new eyeliner comes with one ink cartridge. Cartridges refills are available for purchase, but you cannot buy the empty barrel and cap. Allow me to demonstrate how to replace the eyeliner cartridge. Please use tissues to keep your hands and surroundings clean. The refill cartridge must line up with the bottom of the brush tip and then apply pressure to connect them together. Place the cartridge and tip into the barrel. Watch the white brush of the tip. When the brush is saturated with black liquid, the eyeliner pen is ready to use. Remember to replace the cap to prevent the eyeliner from drying out. I have written on my arm to demonstrate the eyeliner. 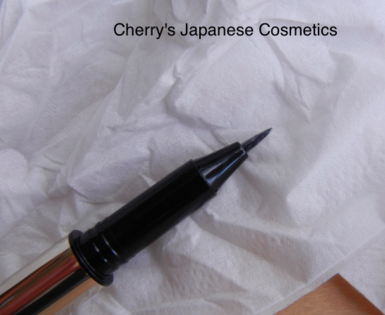 Since toner is not the same as our sweat, tears, or even rain, this Black Keeper Liner may be waterproof if not testing with toner. When I have used non-waterproof eyeliners, my eyeliner would run just because my eyes watered. 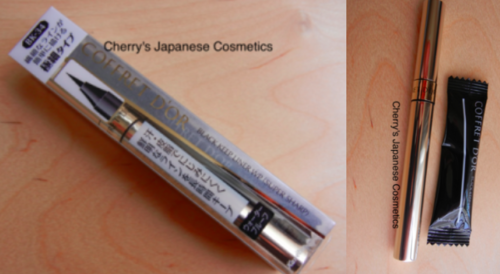 In summary, the Cofret D’or eyeliner ;Black Keep Liner WP is not perfect, but it definitely better than an average eyeliner. 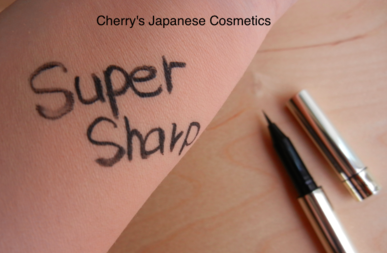 Choose super sharp or standard from “Coffret D’or Black Keep Liner WP“. Wanna order in Yen? Visit our JPY Branch!